BrickLink is proud to kick off our very first MOC-Off building challenge! 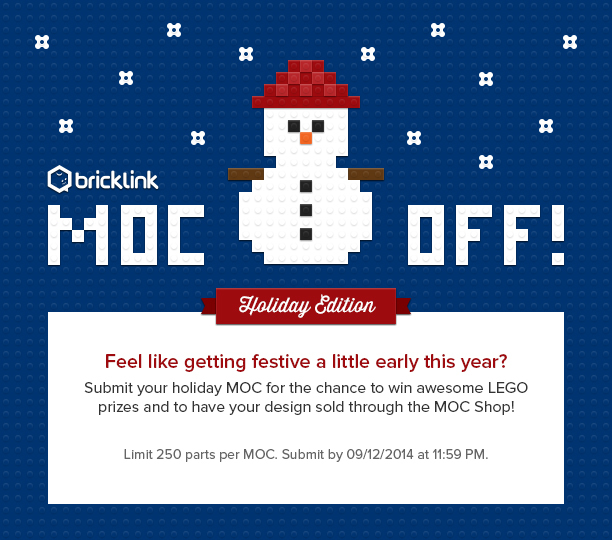 MOC-Off will be a series of challenges in which designers can build in order to win fabulous LEGO prizes and have their designs prepared and sold on the BrickLink MOC Shop. Watch your design go from these challenges into the hands of LEGO fans everywhere! To participate, design anything that reminds you of the special holiday times during the winter. There will also be winners based on the category of design so make sure to check out the details below. Good luck and happy building! It’s time to get festive a little early this year. Create a Flickr account if you do not already have one. Visit and join the BrickLink MOC-Off: Holiday Edition group page. For each design, upload up to 3 images that best represent it. Label each picture with your BrickLink ID and the MOC title. All winning designs will be chosen by the BrickLink Team. Winners will be announced on BrickLink on Sunday, September 14. Please allow up to 3 weeks for your prize to be delivered. Designs must be 250 pieces or less. Stickers/printing are not permitted. Digital entries (LDD, LDraw) are permitted but they must be made of all commercially available bricks and able to be built in real life. Be respectful of Intellectual Property and Copyright laws. Any entry that is in violation will be removed. Contestants will have until 11:59 PM (EST) on September 12, 2014. The window to publish a MOC to the competition will be automatically closed at midnight. All images must be uploaded to the proper Flickr group mentioned above. All digital entries must be represented with high quality renderings. Please no screenshots of your MOC. Please make sure you agree to the following terms before participating. make the MOC available commercially. Winners will work together with BrickLink to provide the necessary build info required to create building instructions. ** Note that designers will still retain ownership of their MOC and receive design fees accordingly. It has been a little over one year since the Bricklink story embarked on a new chapter with us being fortunate enough to become the new care-takers of Bricklink. We are proud to share with you that during this time, the community of LEGO-fans who use Bricklink keeps growing steadily. Our user base counted more than 315 thousand members by June 2014, almost 30% more than a year ago. We also observe an ever-growing number of items for sale: As of June 2014, Bricklink hosted 8,394 stores, displaying more than 276 million items, up 19% and 47% compared to a year ago. In sum, we’re very happy and grateful to be part of the largest & fastest-growing online LEGO platform in the world, which wouldn’t be possible without your continued love and support of Bricklink. In the past year, great efforts were put into bug fixes and security upgrades for Bricklink 1.0, preparing the launch of BrickLink MOCShop and laying the foundations for Bricklink 2.0 & beyond. To realize these projects, we recruited dozens of young, highly talented people who are passionate about LEGO. We are keenly aware that as an organization, we have much to learn still, but we believe we have the right people in place to speed up our learning process and bring innovation that will improve your user experience. Financially, Bricklink is displaying promising revenue growth at a double-digit yearly pace, but as we find ourselves in the investment/growth phase of our story, we are slightly losing money. Nevertheless, we are very excited about the future and we are happy to help our members, stores and designers we are inviting as of this year, in any way we can. Thanks again for your support and we hope you will enthusiastically adopt the new features we will roll out in 2014 - 2015! Alice and Jay at a convention.